Artist’s rendition of Ship-to-Shore Connector (SSC) landing craft. The SSC landing craft can travel at a speed of 35kt. Image: U.S. Navy photo by Monica McCoy. A SSC prototype passed seaworthiness tests in May 2013. Image courtesy of United States Marine Corps. The US Navy’s Landing Craft, Air Cushion (LCAC) will be replaced by the future SSC landing craft. Image: U.S. Navy photo by Journalist Seaman Apprentice Charles A. Ordoqui. The Ship-to-Shore Connector (SSC) landing craft is being developed by Textron Marine & Land Systems team to replace the US Navy’s Landing Craft Air Cushion (LCAC) hovercraft fleet. The landing craft is designed for the US Navy and the US Marine Corps forces to transport personnel and armoured vehicles between naval ships and shore. It is also suited for amphibious assault, humanitarian assistance and disaster response missions. It can be deployed from naval ships such as USS San Antonio (LPD-17) landing platform dock, LSD-41/49 landing ship dock, LHD/LHA amphibious assault ships, and Expeditionary Transfer Dock (formerly Mobile Landing Platform). 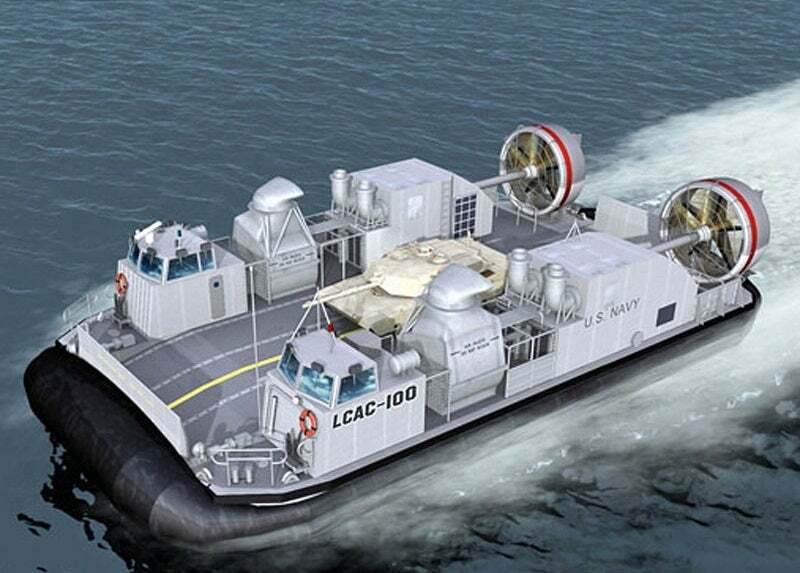 The US Government plans to procure one test and training craft (LCAC 100) and up to 72 operational craft under the SSC programme. Textron Marine & Land Systems and L-3 Communications entered a deal to develop the US Navy’s next-generation landing craft in October 2009. Aluminium structures manufacturer Alcoa Defense joined the SSC development team in September 2010. Textron Marine & Land Systems team received a $213m contract from the US Navy in July 2012 for the design and construction of one SSC test and training craft with an option for eight production craft. A contract option for the first production craft (LCAC 101) was awarded in August 2014 and an $84m order for LCAC 102 and LCAC 103 was placed in April 2015. As the prime contractor, Textron Marine & Land Systems is in charge of building the craft, while L-3 Communications is responsible for the design, integration and testing of C4N suite (command, control, communication, computers and navigation). Rolls-Royce won a contract in October 2012 to supply gas turbines for the SSC hovercraft fleet. "The US Government plans to procure one test and training craft (LCAC 100) and up to 72 operational craft under the SSC programme." The LCAC 100 prototype craft is scheduled to be delivered to the US Navy in February 2017, while the production craft will be delivered by 2020. Initial operational capability of the SSC craft is planned for August 2020. Built using aluminium alloys, the SSC landing craft’s hull offers increased stability, corrosion resistance, and lower maintenance costs. The craft’s advanced skirt design permits high manoeuvrability over the sea, while reducing the drag. The overall length and beams of the SSC are 27.9m and 14.71m respectively. The craft is manned by five crew members including a pilot and a co-pilot. The craft has a full load displacement of 180.57t and a payload capacity of 74t. It can hold a single M1-A1 main battle tank on the 1,809ft² cargo deck or can carry up to 145 combat-equipped naval infantry in enclosed personnel transport module. The landing craft is fitted with two MK93 gun mounts, which can be armed with M2-HB .50 calibre machine gun, M-60/M240 7.62mm machine gun and MK19 40mm grenade launcher. The SSC landing craft is equipped with a SAASM-compliant embedded global positioning system (GPS) / inertial navigation system (INS) for providing accurate navigation and positioning. The onboard BridgeMaster E surface search radar provides navigation and situational awareness at sea. Command and control for the craft is provided by AN/APX-123 identification friend or foe (IFF) transponder. In addition, the craft is provided with a number of communications systems including AN/ARC-210 UHF/VHF/SATCOM, AN/ARC-220 HF, and Enhanced Position Location Reporting System for secure voice/data communications. The landing craft’s propulsion unit comprises four Rolls-Royce MT7 marine gas turbine engines, two bow thrusters, two six-blade controllable-pitch propellers with composite shrouds, rudders, and dual input/dual output gearboxes. Each engine delivers an output power ranging from 6,000shp to 7,000shp at 15,000rpm. It consists of a 14-stage compressor, annular combustor, two-stage gas generator, and two-stage power turbines. Controlled by a full-authority digital electronic control system, the engine offers increased fuel-efficiency. The propellers, rudders and bow thrusters provide enhanced manoeuvrability and directional stability for the craft. Electrical systems aboard the craft include two 60Hz, 150kVA gearbox driven generators, two 85kVA auxiliary power units, and a 60Hz distribution system. The SSC craft is capable of travelling at speeds of 35k at sea state 3. It can operate in waters up to 5ft-deep and has a service life of 30 years.